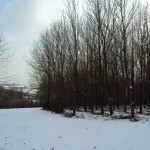 Treragin Wood was purchased by Stephen in 1991. At that time it was a mixture of commercial daffodils and barley. It was planted over twenty years, courtesy of a Farm Woodland Scheme grant, which provided for 30 years of payments. 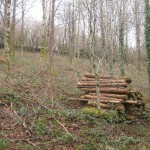 The main species planted were ash and southern beech, with a view to long term management for firewood (ash for quality, southern beech for volume). Oak wild cherry and shrub species were also included. We also planted 4000 Christmas trees in between, as a one off cash crop. Twenty years on the woodland is now being thinned for firewood. 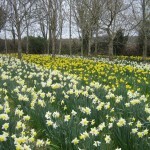 We also mow the brambles in the top area every winter, and continue to pick daffodils commercially. A local field archery club also uses the woodland, as do a number of local dog walking residents. We have considered introducing yurt holidays, but there are only so many hours in the day, so that is a project for another time. Being so close to home we get to visit the wood every day, and enjoy monitoring the wildlife and changing seasons. 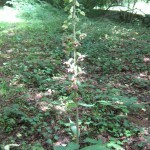 Some highlights have included grass snakes, a frequent woodcock winter visitor, and an increasing number of Broad-leaved Helleborines. In 2012 we counted 152, a record and not bad for a recent arable field!